even cartoons is so learnable! and caricature art is truly within your grasp. Caricatures crack me up - What about you? They crack me up - even bad ones. If they even look a little like the person they’re supposed to be, I still get a kick out of 'em. And well done portraits, they can truly be a thing of beauty. Have you ever thought it might be in you to create any of these? Now get happy: did you know drawing faces or caricatures, or drawing anything for that matter is completely within your grasp? Lots of people tell me what a charge they get out of caricatures, and how impressed they are when they see a caricaturist entertaining at a party or a convention or at the state fair. the artist is sitting at his tilted drawing board. Crowds of interested people standing around watching, admiring, a little awestruck, looking back and forth between the artist and the daring folks who’re paying real money to be drawn. The artist drawing busily and steadily his/her way through the art work, looking up at the subject, looking down at the paper. Drawing hand hovering like a hummingbird looking for sweet nectar. Sketch in an eye brow. The artist looks up at the subject. Then down at the paper. Now zip in an eye, a nose. Looking up, now looking down. Smudge in a little shadow, zigzag in a little hair. The onlookers following the artist’s hand and head movements like a tennis match on it’s side. And it’s all over in 5 minutes, and everyone’s smiling. Well most of the time. :-) It really pulls you in! Then these same people who were telling me how impressed they were watching the artist at work always add something like “but I could never do that”. That used to make me feel bad for these folks, like they might forever miss out on the pleasure and pure satisfaction drawing can offer them. But did you know drawing faces, or caricatures, or anything for that matter is completely within your grasp? It’s all in learning the basics - which most people have never been shown. Most people look at me a little skeptically when I tell them "it's such a learnable skill", not some special gift you either got or didn't get when you were born. And drawing faces or caricatures is just an extension of those same skills - with some fun little twists of course. If you can write you can drawRead this: If you can write, you can draw. You see, it's a skill that can be learned like reading, writing, or driving a car. This is a fact. Some people just stumble on to some of these skills very naturally and at an early age. Others it seems, take a little more digging. Most of those folks - these Picasso types - who stumbled on to at least a few of these skills as kids, well that little bit of skill got them noticed. And getting noticed as having some kind of “gift” got those around them interested in giving these kids just that little extra nudge. The truth is, these “gifted” ones still had to be taught most of what they now know - the stuff that made them great. It was all this extra training and attention built around those early discoveries that helped launch them into the art world stratosphere. Yes, it seems some people are born just knowing they’re supposed to do nothing else with their lives but draw (like the Picassos, the Degas, the Da Vincis). But you can be shown those very basic skills they built their mastery on and without devoting your entire life to it - and still make money doing it. But you just want to draw for fun? Hey that’s great! Maybe you have the drive and vision to become - who knows - the next Picasso. Or you’ll just be tickled to be able to draw a realistic picture of your pets, or even realistic caricatures. However far you want to take it, that's up to you! But you can learn if you want to. I'm hardly the discoverer of that fact, but at this site you can find out how. So what are the basics of drawing? How do I apply the basics? How do you make the leap from drawing faces and realistic portraits to caricatures? What supplies do I need to get started? How much can caricature artists make? What’s this “Drawing on the Right Side of the Brain” stuff? How do I build my own profitable caricaturist / artist's web site? Drawing basics - which are the keys to opening your artistic brain - have little to do with drawing and everything to do with learning to <i>observe</i>. Learn these, and your art will catapult. Mastering celebrity drawings and caricatures: the fastest way to learn and prove your caricature drawing prowess. Do you know what to look for? See here for in-depth examples. 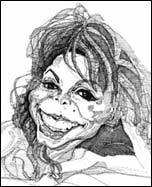 Caricature newsletter - important drawing info FREE! Caricatures - What makes Elvis Presley caricaturable? Caricature of Mark Rosen: Version four - filling in the outline: getting warm! Digital caricatures: do you know the outer limits? Every new technology brings new art forms. Caricatures have realized an amazing renaissance with the new technology. Drawing Caricatures - or just learning to make art: are you ready to dive in? By now, you might be pretty excited: drawing caricatures sure seems like something you must learn. Here&apos;s where to start.